Finalist. Apr – May 2011, Tweed Regional Art Gallery, NSW. In early 2011 Geraldine Berkemeier and Gary Shinfield collaborated in the studio producing a work on paper entitled ‘River’. This image, printed on handmade Chinese paper, was made from existing plates and blocks. It was exhibited in the Community Printmakers Murwillumbah Annual exhibition held at Tweed Regional Art Gallery in Murwillumbah, NSW. The work received a highly commended award from judge, Sasha Grishin. This work was created from plates and blocks originally made for the exhibition entitled ‘River Crossing’ held in Maitland Regional Art Gallery in 2010. Geraldine worked with the technique of waterless lithography and Gary worked with woodcuts made from Finnish plywood. The two techniques were combined in the studio. This image evokes the mood of a river winding through marshes, and flowing intermittently as it makes its way to the sea. It is metaphoric, and a simplification of earlier more complex images. It refers less to specific places in the landscape, and more to atmosphere. 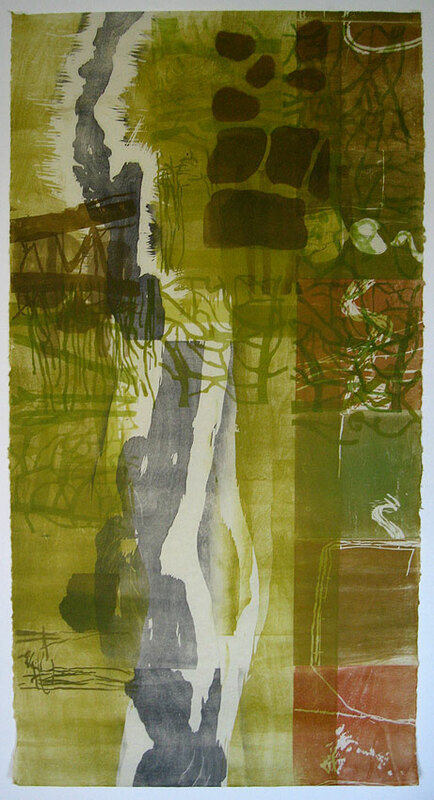 River, Geraldine Berkemeier & Gary Shinfield, mixed media print on Chinese paper, 142 x 70 cm, unique state print, 2010.